I have loved missionary biographies for years because they bring to life Bible passages as people live lives that proclaim God’s faithfulness and power. 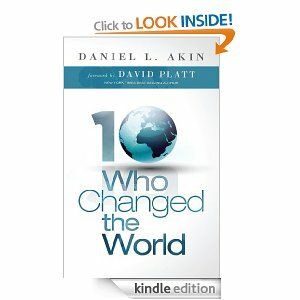 Having a Kindle means that I can pick up books very cheaply when there is a sale on them and when Ten Who Changed the World was on sale I picked it up. The book profiles ten missionaries or missionary couples, from throughout the centuries, who served God all over the world. You may have heard of some of the names or read about them before. The book does give brief biographies of the different people and details how they embodied different Bible passages in their lives. So not only was it good to be reminded of Biblical truths, it was also great to see how they were lived out. Some of the stories were incredible – how people faithfully served and laboured in the country they were called to for years before seeing any results, people who served despite severe persecution or spiritual adversity, people who again and again saw God’s faithfulness and provision. This book serves as a great introduction to amazing testimonies of God’s grace and how He works through ordinary, sinful people.